Moving on, I had no idea that making this shaker of delicious popcorn seasoning love potion, would be so easy, and (bonus points!) no scary chemicals. Just some soy milk powder, nutritional yeast, and spices. 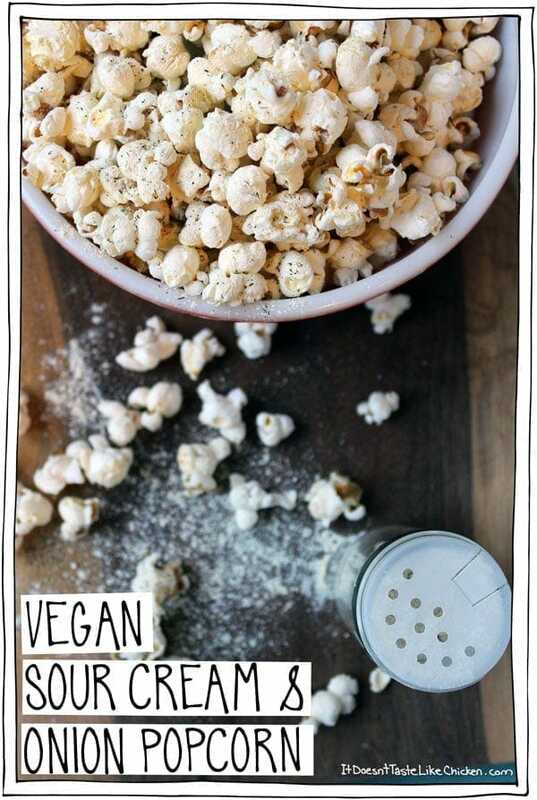 Ok, ok, I admit, that not everyone has soy milk powder and nutritional yeast on hand, but you should, because then you can make this popcorn seasoning, surely a good enough reason. For those who don’t know the beauty that is nutritional yeast, it’s this yellow flaky stuff you find in the health food section of your grocery store. Bob’s Red Mill makes it, but so do lots of other people. I am the first to admit that yellow flaky stuff doesn’t sound super appealing, but it is. So there. It kind of has this nutty cheesy flavour and makes everything taste even more awesome, so you definitely need it. As for the soy milk powder, that can be found in the baking section, health or bulk food stores, and of course, online. Once you have all your ingredients ready, dump them into a bowl and mix it all up. Now take a spice shaker, empty it’s contents into a different container making a huge mess and spilling it all over your kitchen, find an empty spice shaker, and fill with your new popcorn seasoning. Shake over popcorn, kale chips, potatoes, anything you like! Then shake, shake, shake, do dah doot dah duh doot dah. Side note: I particularly like the couple in matching black spandex outfits who are pretty confident, spinning in circles = coolest dance move ever. I’m convinced. Vegan Sour Cream & Onion Popcorn Seasoning. No scary chemicals. Just 5 ingredients you already have in your pantry! Grind the nutritional yeast into a fine powder by using a mortar and pestle, blending it in a spice grinder, or just rubbing it between your hands. The goal is to make a powder fine enough to mix well and be able to easily shake out of the lid of your spice container. Add everything to a bowl, mix it up, and fill your shaker. Make some popcorn the way you usually would, and then shake, shake, shake! Feature Ingredient: Nutritional Yeast! 184 days, 68 Ingredients to go! Totally addicted to this stuff! Way better than commercial seasonings. Yay!! Thrilled you enjoy it so much, Mary. i have made this with soy milk powder and regular skim milk powder. both turned out great. I added this to potato salad and my hubby RAVED. Thanks Sam! Nutritional yeast should be renamed Longevity Powder since it makes you want to live longer so you can keep eating it. Hi this recipe sounds great! I would love to try it but my boyfriend is allergic to almonds and soy–would coconut milk powder make this too sweet? Thanks to this recipe I’ve made more popcorn in the past 2 weeks than I’ve had in the past 20 years lol. I’m not a fan of butter so I always found movie popcorn and microwave popcorn disgusting. 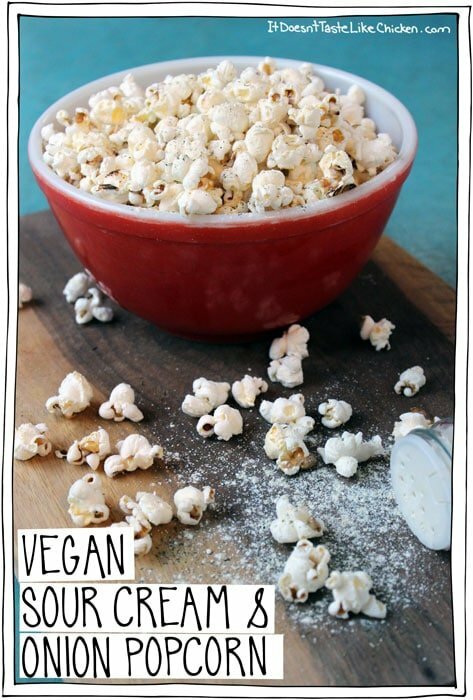 Knowing that popcorn is a healthy snack, though, I decided to give this recipe a try. I bought non-gmo popcorn off of Amazon and followed Sam’s instructions on how to pop my own popcorn on my stove top. For those of you who have never popped popcorn over stove top before, I can’t stress to you enough how EASY it is! It literally takes like 3 or 4 minutes and is so much cheaper and healthier than microwave pop corn so give it a try! I found that, while I’m not a fan of butter, this recipe actually tasted better with a little bit of melted vegan butter drizzled over the pop corn as it helps the sour cream and onion seasoning stick better. I also added a little bit of Himalayan salt. So yummy! That sounds perfect!! Popcorn is for sure one of my all time favourite snacks! Looks so delish! Is it hard to make the powder stick without any liquid? 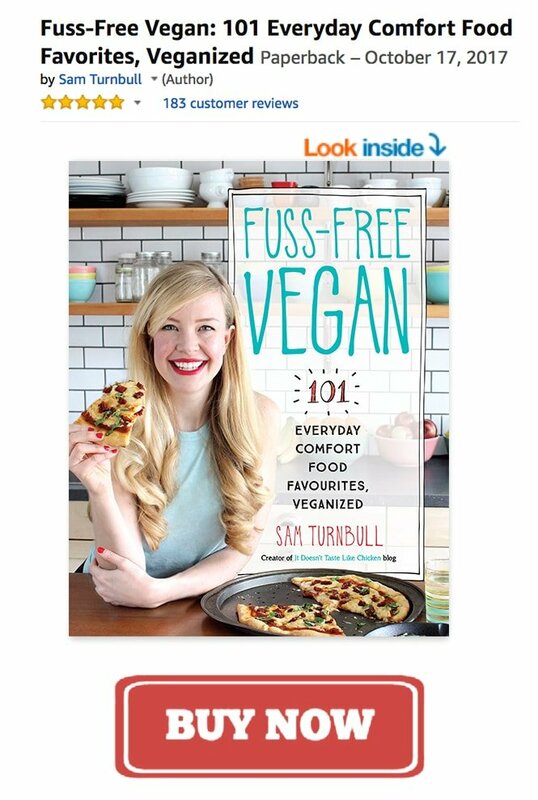 You could melt some vegan butter or use an oil mister to spray a bit of oil to help the seasoning stick. I usually don’t bother tho. Will this still be as good/about the same without the soy milk powder? It will still be good, but it definitely won’t be the same, as the soy milk powder is what adds that creamy sour cream flavour. Enjoy! I can’t have soy, soy I would use powdered sour cream. I would recommend almond milk powder or coconut milk powder (as powdered soy cream isn’t vegan). I haven’t, but that sounds delicious!! This looks like an awesome snack (or breakfast)! Haha, it is an awesome snack… I don’t know about breakfast though! But hey, I’m not going to tell you what to eat for breakfast! Why dill? Wouldn’t dried chives ground up into a powder give a more oniony flavor? Hi Nita, you could totally used dried chives! I haven’t noticed them at my grocery store, but if you have ’em go for it! There is lots of onion flavour from the onion powder, and I like the way the dill adds a small amount of tang, but make it the way that suits your tastes preferences. Enjoy snacking! Oh man, my husband would DIE over this. He’s a major popcorn lover, and the sour cream and onion.. damn damn! 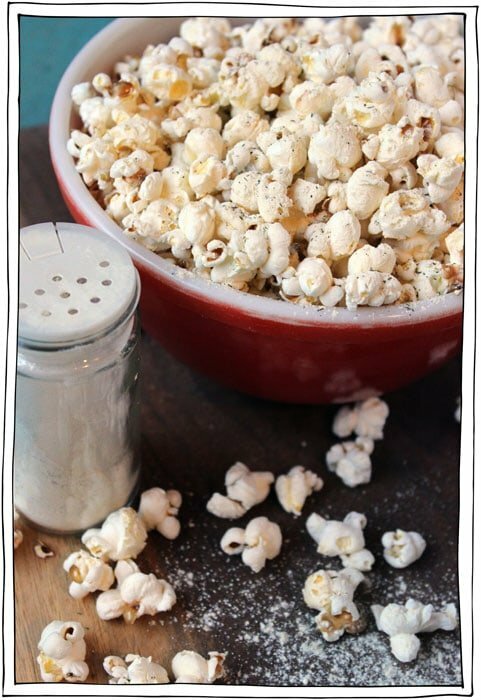 You just can’t go wrong with popcorn! My boyfriend doesn’t really understand my obsession, but I just love it!